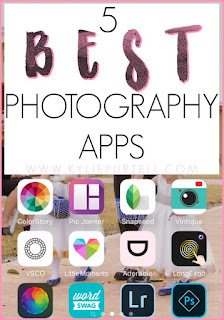 Two years ago I wrote a post called Best Photo Editing Apps and shared some of my favourite apps that I used to edit my photos. In two years a lot has changed and there have been a whole bunch of new photography apps released. 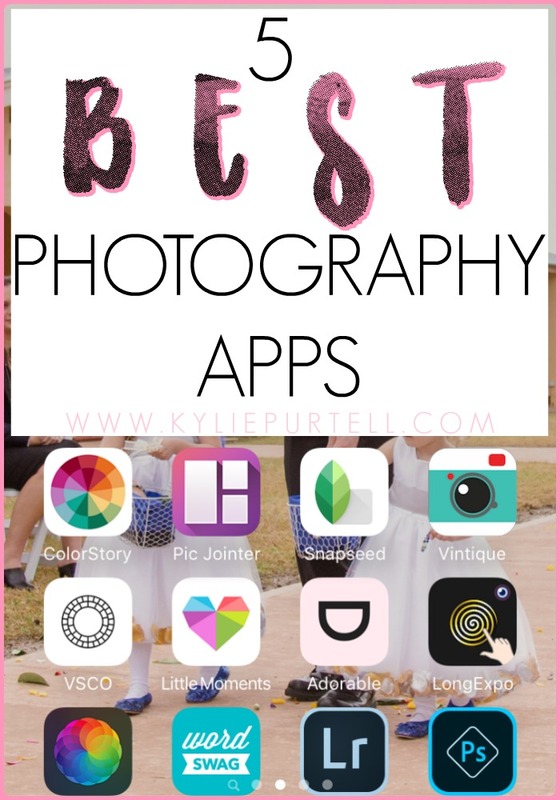 So I thought it was time I revisited this topic and shared with you what I now consider to be the best photography apps in 2016. I want to start by saying straight-up that 95% of my photo editing is done on my computer using the Adobe programs Lightroom and Photoshop. However there are times when I'm out and about and I've been snapping photos on my phone (or on my big camera and I've sent them to my phone via my camera's built-in wifi) and I want to clean them up and add a little pizazz before I share them online. From the ladies behind the stunning website A Beautiful Mess, A Color Story is probably my favourite new photography app of the last couple years. Released earlier this year, I pretty much love everything about it. It has a really good range of technical editing tools from the basics (think crop, clarity, contrast, brightness, etc) through to more advanced and fun tools, such as Hue Shift, Curves, Sharpening, and the ability to add a tint to the highlights, midtones and shadows. On top of it's excellent technical editing tools it has an awesome range of filters and effects (light flares & leaks, bokeh, etc). It's worth purchasing all of the filters and effects (there's only a small selection available when you download the app) for A Color Story because you'll pretty much be able to find a filter to suit whatever look and mood your going for with your photo. Best of all you can layer your filters without having to apply one, save it and then open your saved photo to apply a second filter over the top like in most other apps. With A Color Story, you can apply one filter, hit the tick, and then add another filter straight over the top of that. You can also see a list of all of the adjustments and filters/effects you've added to your photo and save that as your very own personal preset, meaning you can achieve a consistent editing look across multiple photos with one press of a button. Compared to some photography apps it's stupidly simple to use, and the interface is clean and easy to figure out. A Color Story is free to download and available on both iPhone and Android. I always have to include a collage app when I do these posts because who doesn't need a good collage app. In my last photography app post I listed Pic Collage as my collage creation app of choice, but since then I have found a much simpler to use app, that still has all of the same features. Pic Jointer is by far the easiest collage app I've tried. And I've tried a lot of them! It has all of your basic collage layouts and it's super easy to customise the frames. The best thing is, unlike a lot of collage apps you have heaps of choices on what aspect ratio you want your collage to be. So rather than only being able to work your collage as a square or standard portrait size, you have much more choice, meaning you can control how much of your image is chopped off once it's placed within the collage. Best of all, it's free, but as far as I can see, only available on iPhone. Snapseed is one of the first photography apps I downloaded when I got an iPhone and I only used it a couple of times before I got frustrated with it and stopped. Since then the user interface has been much improved and there are a lot more options in terms of technical editing tools and creative editing tools. Snapseed's two best technical editing tools, in my eyes, and the ones that elevate it above a lot of others, are the Healing and Selective editing tools. The healing basic allows you to "photoshop" blemishes from your image. If it's a face you're editing, you can remove pimples or scratches. With the selective tool you can select a small part of your image and apply a local adjustment to it. So going back to a portrait, it would allow you to brighten an eye to make the catchlights pop. If there is a certain part of your image that you really want to make the colour pop in, you can adjust the saturation in that area too. Snapseed also gives you the ability to add text to your images, and has a really cool range of creative editing tools (filters) like lens blur, glamour glow, HDR landscape enhancement, as well as some different frames to choose from. Snapseed is available free to download on iPhone and Android. Vintique is my go-to app when I want to have a little fun and go a little crazy with my edits. It has a huge range of filters to choose from, with more added all the time. There are two really cool features of Vintique that keep this app in my top 5 best photo editing apps list. Number one... the ability to edit each of the filters. You can go in and turn off or on certain aspects of the filter, from the colour, hue, warmth, vignette, light leak or texture, allowing you to really customise the filter to your liking. I haven't seen this on any of the other photography apps I've ever used and it's a really great feature. As well as the range of filters there is also a limited range of technical editing tools (although it also has a Hue Shift tool for creating those candy-like colours) and quite a large selection of vignettes, textures, seasonal and sunflare overlays. It also has the ability to add text to your images. The number two feature that keeps this app in my top 5 is the ability to place your landscape or portrait orientation image within a square frame and not warp the image or lose any of it. You know those photos you see on IG that have white bars at the top & bottom or sides? You can use Vintique to do that. Vintique is available on both iPhone & Android and costs between $1-$1.50 AUD. VSCO is probably the most well know of all of the photography apps. In fact last I heard, the #vscocam hashtag was the most popular on Instagram, ever. And for good reason. VSCO as a photo editing app is very well-rounded. It has a great range of technical editing tools that are really easy to use. It also has a great selection of filters included in the initial download, and even more to purchase if you so wish. I have quite a few of the VSCO filters now and my favourites are probably C, K1 and X1. You can adjust the strength of the filter as well, which is always good. 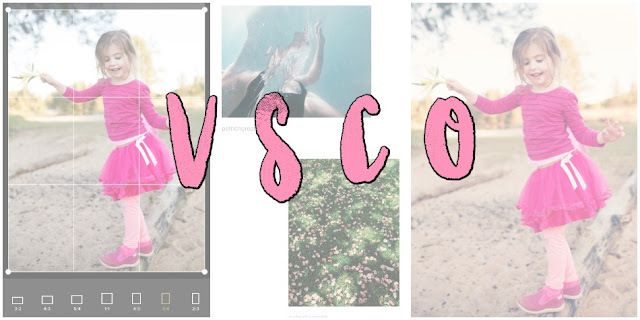 One of the best things about VSCO, like A Color Story, is that you can see a list of the edits you've made to your image and then save that as a preset to quickly apply the same edits to another photo. You can also use that list to delete an adjustment or edit without having to start over again. VSCO is free to download on both iPhone & Android. Lightroom for Mobile (if you have Adobe's Lightroom editing program I highly recommend you get yourself Lightroom for Mobile. It's super easy to use and the BEST technical editing tools of any app I use. 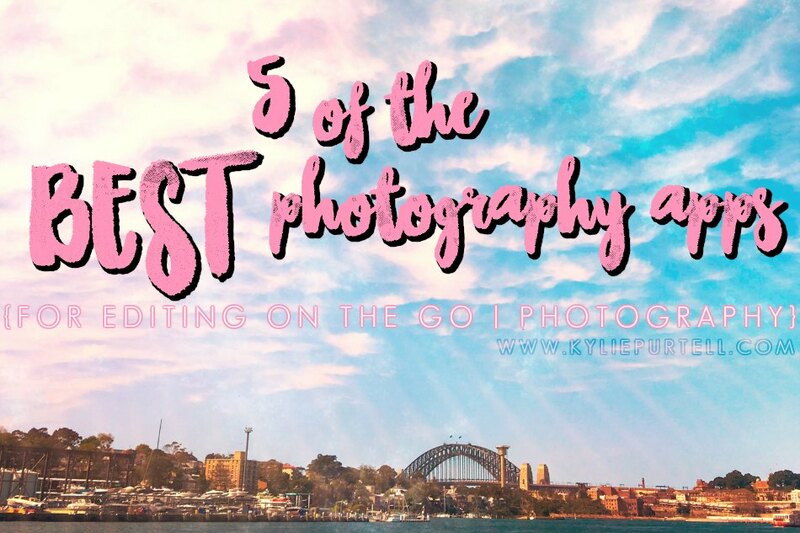 It is my go-to for most technical editing on my phone, however I haven't included it in this top 5 because it's a more advanced photo editing app, whereas I wanted to keep the top 5 about apps that anyone with a basic knowledge of photography can use confidently and without being overwhelmed). 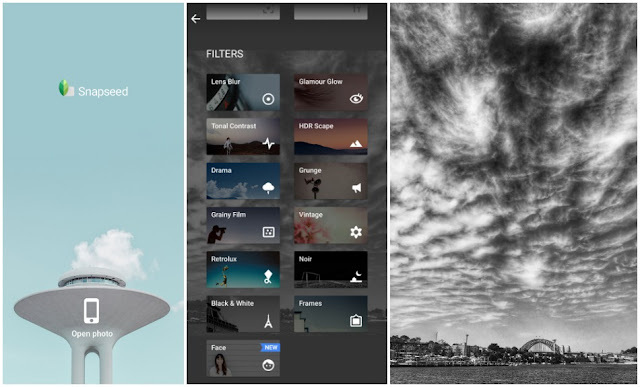 What's your favourite photography app (aside from Instagram that is!)? 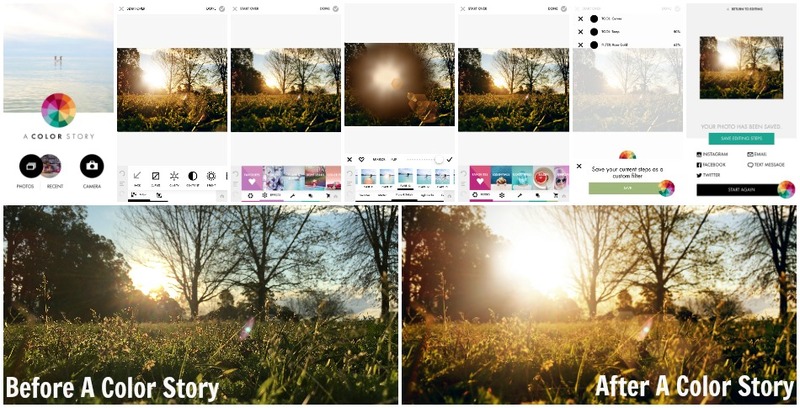 What app do you do the bulk of your photo editing with?